Kelly and Erik of Homegrown Evolution wrote about unusual fruits today. I'd like to thank them for letting me know about a book called, The Fruit Hunters: A Story of Nature, Adventure, Commerce, and Obsession, which I just ordered. The Coco de mer (Lodoicea maldivica) is a palm tree that grows on the islands of Praslin and Curieuse of the Seychelles Island Chain in the west Indian Ocean. 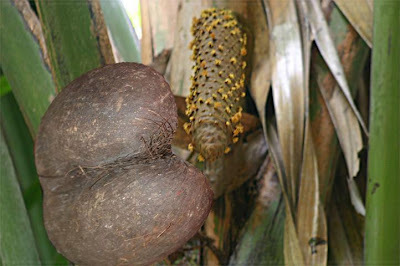 Its fruit (shown above), weighing up to 22 kg and measuring up to 50 cm across, contains the double coconut, which is the largest seed in the world. It's so called because it has two lobes each resembling a coconut, and is an example of a sea-bean or drift seed -- designed to be dispersed by the sea. It's also called the coco fesse, sea coconut and Seychelles nut. Sailors who first saw the double coconut floating in the sea imagined that it resembled a woman's disembodied buttocks. This fanciful association is reflected in one of the plant's archaic botanical names, Lodoicea callypige -- callipyge is from Greek words meaning ''beautiful rump." Until the true source of nut was discovered in 1768, it was believed by many to grow on a mythical tree at the bottom of the sea. The coco de mer is now a rare protected species. Plants have separate sexes, and thus there are male and female trees.